The Old Newburgh Presbyterian Church (also known as Newburgh Town Hall) is a historic church at N. State and W. Main Streets. Following the New Madrid earthquakes from 1811-1812, religious fervor in the town increased, leading to a push for more houses of worship. In 1841, a new church was built at 10 W Jennings Street with the generosity of Mr. Abraham M. Phelps (see separate biography), a prominent businessman whose wife Frances was a member of the First Presbyterian Church in Newburgh. This house of worship became Cumberland Presbyterian Church, and was later the location of the Delaney School. Construction of a new building, which would later be known as the Old Newburgh Presbyterian Church, began in 1851 at a cost of $4,000. The land donated by Mr. Phelps was dedicated June 25, 1853. It was a two story structure built of brick. The Sanctuary was on what is now called the second floor. At the rear of the Sanctuary was a small choir loft which was reached through a robing room, later the pastor’s study. The lower level was (from 1853 to 1857) occupied by the Delaney Academy which had moved from the original frame church on Jennings. During the Civil War the church bell tower was used to signal to call the Home Guard when danger threatened. The rope ran from the belfry to the Hopkin’s house next door. This was considered a convenient and safe method of ringing the bell should someone be unable to get to the church. In 1880 the Newburgh High School held graduation services there for four graduates. In 1906 the congregation (which was organized in 1837) voted to withdraw from the Cumberland denomination. The new name was given as Newburgh Presbyterian Church. The building was remodeled in 1927 and again in 1938, when the cornerstone was removed. The sanctuary was redecorated and choir stalls were placed on each side of the chancel and a chancel rail placed across the front. Nelson Wilson, a southern Indiana artist, painted a pastoral scene on the wall behind the pulpit. A new electric organ was installed and dedicated on 2 October 1938. In the 1937 flood, the building was headquarters for the National Guard. 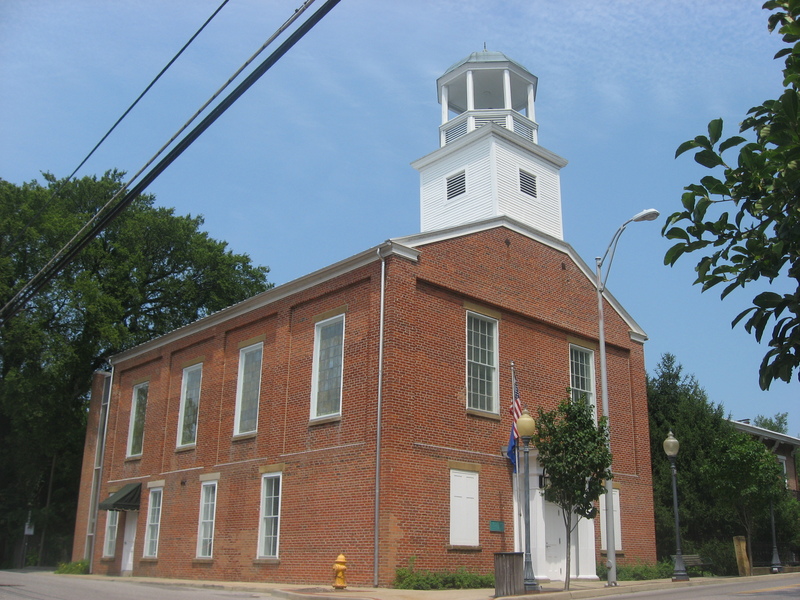 In 1965 the building was sold for $14,000 to the town of Newburgh and referred to as Town Hall. Several remodeling projects were completed from 1968-1973. The yellow stucco placed on the building was removed in 1968 at a cost of $7,500. The building was placed in the National Register of Historic Places 1978. It served as the seat of government and focal point of the downtown until July 2006. In 2006, the seat of government and Town Hall offices were moved to their current location at 23 West Jennings. In 2007, the building was completely restored and rehabilitated with the assistance of a $500,000.00 Office of Community and Rural Affairs Community Focus Fund Grant. The design concept was one of restoration and adaptive reuse. All portions of the exterior of the building were faithfully restored. A new roof, gutters and down conductors were installed, all to match the existing materials and configurations. Though the bell tower had been significantly modified in the past, old photographs were researched and utilized in achieving a historically accurate restoration. Existing brick masonry was repaired in accordance with the Secretary of the Interiors Guidelines for Historic Restoration. The original stained glass windows at the second floor were mostly intact but, where necessary, were refurbished and reinstalled. A small building addition at the west facade to accommodate an elevator for handicap accessibility was completed. The interior of the structure was completely gutted and reconstructed to appropriately provide for the proposed uses. At the first floor, the space provides for museum displays, which will include historic photographs, artifacts, and memorabilia of Newburgh. Also on the first floor are the restrooms and a full caterers’ kitchen. On the second floor, the original large assembly space was re-created for meetings, presentations, receptions, and cultural events. The elements that were incorporated into the finish construction such as trim at doors and windows, wainscots, and balustrades match the existing historic elements in terms of material, profile, and finish. The final product is a historically accurate restored and rehabilitated facility, accessible to all, available for continued use by Newburgh citizens and visitors. The upstairs hall has been named Ebenezer Hall after the first minister of the congregation. Today the building houses the Newburgh Museum, which was dedicated in 2012.